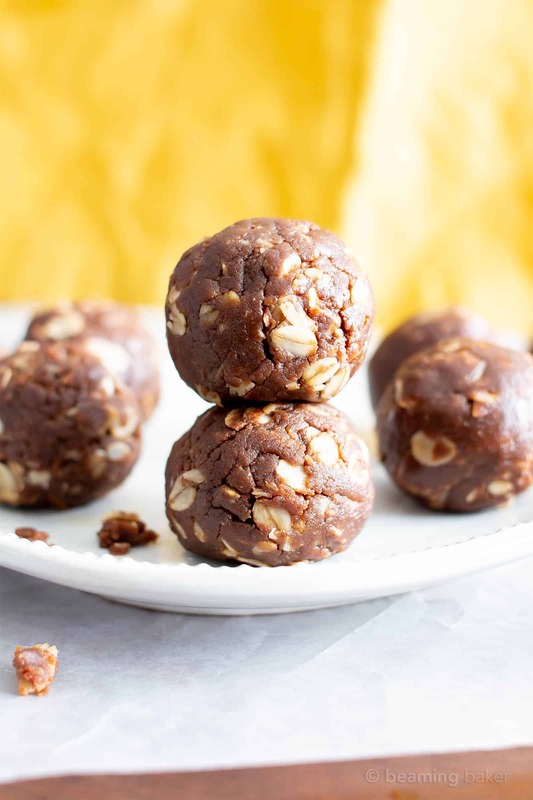 4 Ingredient No Bake Chocolate Peanut Butter Oatmeal Energy Balls (V, GF, DF): a super easy ‘n healthy recipe for soft, chewy chocolate protein bites that taste like rich chocolate peanut butter cookies! Vegan, Gluten-Free, Dairy-Free, Healthy. … in April! Then I blinked and it was summer. And another blink (when will I learn to stop blinking) and it’s August! But you won’t be hearing any complaints from me. I love, love, love all of the pumpkin that’s to come. 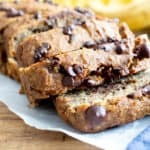 Making and re-making all of my old, beloved pumpkin recipes (pumpkin bread, maple pecan pumpkin muffins, pumpkin breakfast bars… even a pumpkin pie smoothie!!) and getting out my cozy blankets. What is it about being wrapped up in a thick, cozy blanket that feels so good? And yet, there’s still this teensy, tiny period in between summer and fall that’s known, and shall forever be known as, back-to-school!! Every year, no matter how old I get, I’m swept into the fervor of back to school. Maybe it’s all those years of ingrained schooling. Maybe it’s because two of my sisters teach. Or maybe it’s because I live so close to my young nephews that I get excited, too! 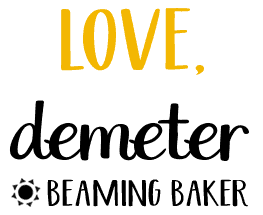 So I’ve made it my mission in life and on the ol’ blogeroo to make and share the easiest healthy snacks possible. 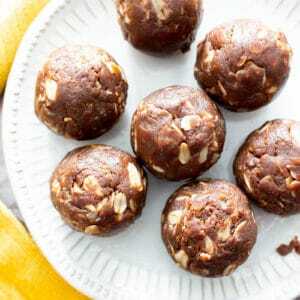 Welcome to my latest easy + healthy snack creation: 4 Ingredient No Bake Chocolate Peanut Butter Oatmeal Energy Balls. They’re currently Erik and my favorite snack. Super duper easy to make. One of my favorite aspects of these snacks? They keep FOREVER. Okay, not forever, Fact Police. But for at least 3 months. We tried our darnedest to keep them for longer, but could no longer resist eating them all. Even though we made a triple batch. 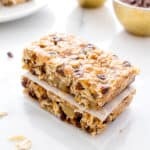 And there were peanut butter chocolate chip oatmeal breakfast bars, vegan chocolate cupcakes, and no bake peanut butter oatmeal cookies also in the house. What can I say? We’re snack fiends! So whaddya say? Are you ready to rock and roll? I so could not help myself! I’ll grab my favorite 2-tablespoon cookie scoop (let’s be honest, all three of them! ), you grab the peanut butter. I’ll meet ya in the kitchen! Thank you so much of stopping by, chatting with me and making all of these delicious creations. I hope you and your loved ones just love these! 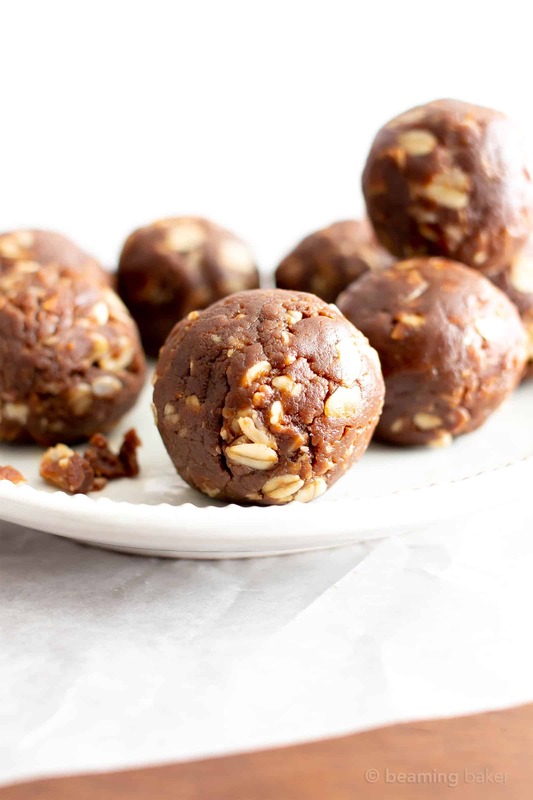 4 Ingredient No Bake Chocolate Peanut Butter Oatmeal Energy Balls (V, GF, DF): a super easy ‘n healthy recipe for soft, chewy chocolate protein bites that taste like rich chocolate peanut butter cookies! Vegan, Gluten-Free, Dairy-Free. 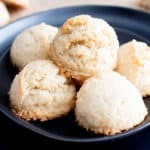 Using a 1-tablespoon or 2-tablespoon cookie scoop, scoop and drop balls onto the prepared baking sheet, evenly spaced apart. Using your hands, roll into bites. Enjoy immediately, or, chill in the freezer for 15-25 minutes before storing. Storing instructions below. 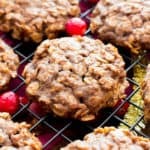 Adapted from my 3 Ingredient No Bake Peanut Butter Oatmeal Cookies. 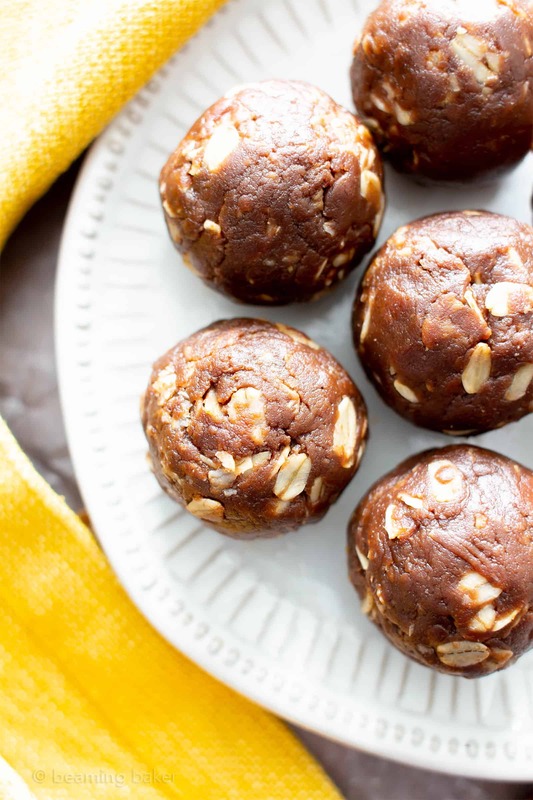 Try my 4 Ingredient Chocolate Peanut Butter Energy Bites or my 4 Ingredient Chocolate Peanut Butter Oatmeal Cookies! - Store in an airtight container in the refrigerator or at room temperature for 1-3 months. These look fabulous! 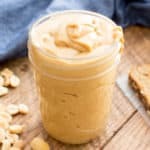 I’m not a huge peanut fan but I think they would also be great with almond butter. 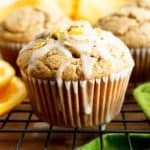 I might try them with sunbutter too, to make them school-lunchbox-friendly. Thanks! 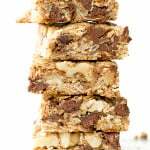 This has all the makings of a perfect treat: peanut butter, oatmeal, gluten free and no bake. I need to make a batch for afterschool snacks! 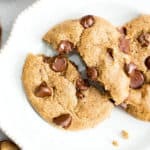 Yes, so many amazing ingredients in these bites! ☺️ Hope you and the kids enjoy Amanda! These look like the perfect healthy snack! You’ve got that right Amy! ???? 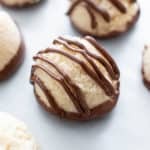 You can never go wrong with peanut butter and chocolate! These look amazing! No you can’t Jessica! Such a perfect combo! ???? 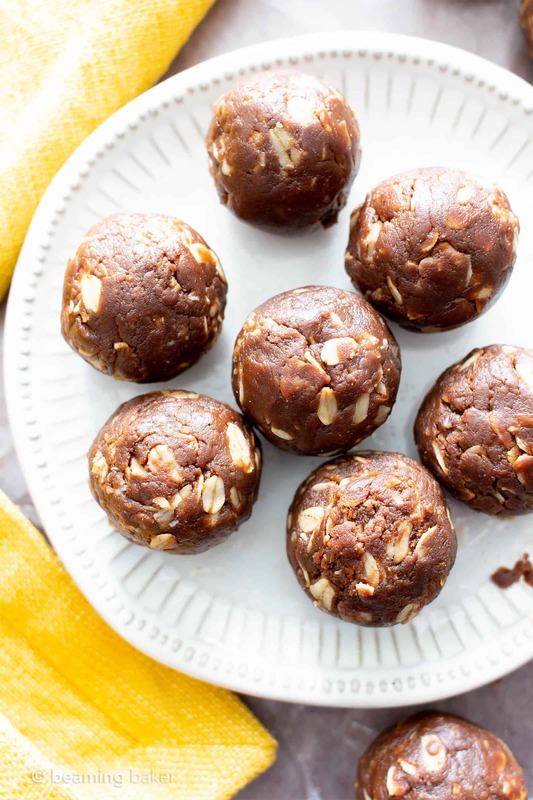 When it comes to snacking, am always reaching for PB + Chocolate so this recipe with oats and maple syrup is perfect for me – thanks so much for sharing it, Demeter! Oh yes! All of those add up to some seriously tasty treats. ???? Thanks Shashi! 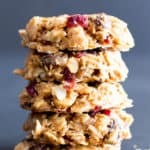 When it comes to snacking, am always reaching for PB + Chocolate so this recipe with oats and maple syrup is perfect for me – thanks so much for sharing it, Demeter!! Yay! That’s so wonderful to hear Brittany! I’m thrilled that everyone enjoys them. ☺️ And yes on the brownie taste—gotta love that chocolate flavor! ???? OMG I love the flavor of these! Yay! Isn’t it just the best combo? ???? No bake cookies have always been a favorite. I have missed them since I have been eating cleanly. THIS recipe is exactly what I’ve been looking for! Woohoo! No bake treats are definitely the best. 🙂 Hope you enjoy these Dorothy! Such an easy and yummy snack! You know it Jamielyn! ???? That’s fantastic! Hope he enjoys them Delaney! My husband & I are planning a little road trip and these would be perfect to take along! And so easy to make, too! Woohoo! Yes, these are absolutely made for road trips! Hope you enjoy the bites and have loads of fun! ???? Heck yes! I can see myself making these all the time!